Pattern Number: DTP004. A quilt made for a college bound student this knockout project is actually made from warm flannel fabrics. 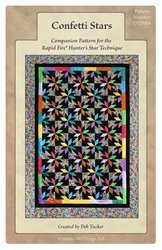 Using Deb’s Rapid Fire Hunter’s Star tool and techniques it can be made quickly and accurately.